(Portland, OR) – Assembly Brewing, co-founded by George Johnson and Adam Dixon, officially opens its doors for the grand opening on Friday, March 29 at 11 am. Located at 6112 SE Foster Road in Portland, the highly-anticipated 15 barrel capacity brewery invites 21 and older patrons to enjoy authentic Detroit-style pizza while sampling a selection of seven beers available on day one, with more to come. Four years in the making, it is the first craft brewery to open on Foster Road, located just northwest of the intersection at Holgate Blvd, and it is one of the few minority owned breweries in the country. The tap list will include seven beers at opening (two pale ales, two IPAs, an amber, stout and porter), all easy drinking and balanced beers that range from 5.5-6.5% ABV and are brewed to pair with the restaurant’s pizza. Alongside the signature ales, created by head brewer and neighborhood resident George Johnson, local Cider Riot cider on tap, wines, and a selection of hand made cocktails and spirits are also available. Draught beer is $5 per pint and well drinks are available for $5. Using a proprietary dough recipe that Johnson crafted with the assistance of the award-winning pizza chef, Shawn Randazzo, the Detroit style-pizzas are made to order in two sizes (with a vegan cheese option available). The style stands out from traditional pizza due to its rectangular shape, airy texture, extra thick crust, crispy and caramelized cheese edges. Johnson, who was born and raised in the Detroit area assures the pizza is one of only a few places on the West Coast that is serving a true-to-style representation, made in house daily, with quality ingredients. The 7,500 square-foot facility features a 15 BBL capacity brew house supported by old-growth Doug Fir beams, a spacious reclaimed wood bar, and dining area with a giant mural painted by local artists; the piece is inspired by Diego Rivera’s series, Detroit Industry Murals. The restaurant seats 120 guests and up to 60 guests outside on the heated patio. Pinball machines along with a small performance area will keep visitors entertained until closing time at 2 am. As summer approaches, Assembly Brewing plans to add a pizza and Crowler® delivery service. Stay tuned for beer releases and future announcements on its social channels and online at https://assemblybrewingco.com. 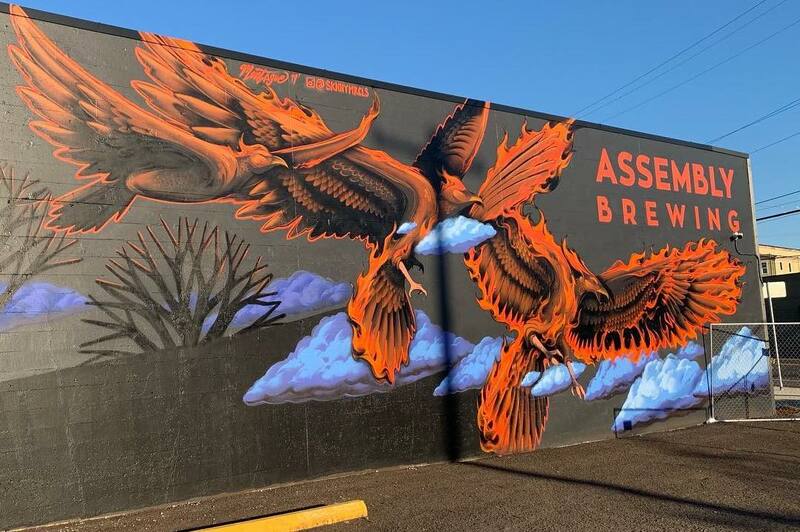 Built on a neighborhood craft-brewery dream and authentic Detroit style-pizza expertise, Portland friends and SE residents, George Johnson and Adam Dixon established Assembly Brewing in March 2019. One of the most highly-anticipated craft breweries in the Portland metro, it offers patrons 21 and older a wide selection of balanced American Ales that can be enjoyed with its signature pizza offerings, until 2 am daily. Visit us online at https://assemblybrewingco.com.